A new and revolutionary “bathroom concept” that proposes taps and mixers for the bathroom and shower solutions which are safe for both the environment and people, in line with the new trends and needs of interior design and furnishing. Fir Italia presents Green Total Look, a new way of looking at the bathroom, proposing mixers and taps for the bathroom and shower solutions, which are safe for both the environment and people. 1. Eco-friendly, reliable and totally hygienic materials. AISI 316/L stainless steel taps and mixers. Built-in parts in lead-free DZR brass. 2. “Energy saving” solutions to optimize water consumption. A 6 l/m water flow reducer installed on all taps and mixers and a 9 l/m water flow reducer on all shower heads, with a consequent saving of about 50% of water consumption in the bathroom. 3. Ultra-minimalist design of new generation. 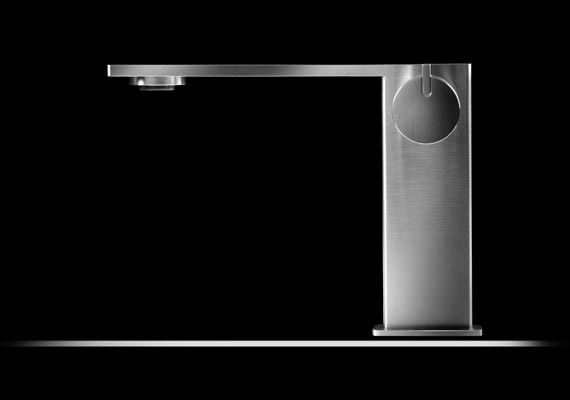 Reinterpretation of the squared and cylindrical styles thanks to the stainless steel characteristics. PlaySteel® comes to life from a new generation ultra-minimalist square design concept, which uses the characteristics of stainless steel to create extreme shapes and thicknesses. The water spout gets thinner and thinner. 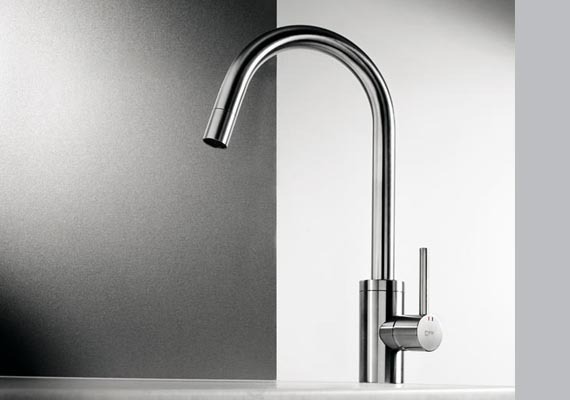 The lever extends out over it, adhering completely to the body, optically blending together to create something entirely new in the world of taps and mixers. LifeSteel® reflects the same aesthetic precepts of PlaySteel®, although with a substantial variation: the handle has become a particularly proportioned and ergonomic cylindrical element, in a lateral position. 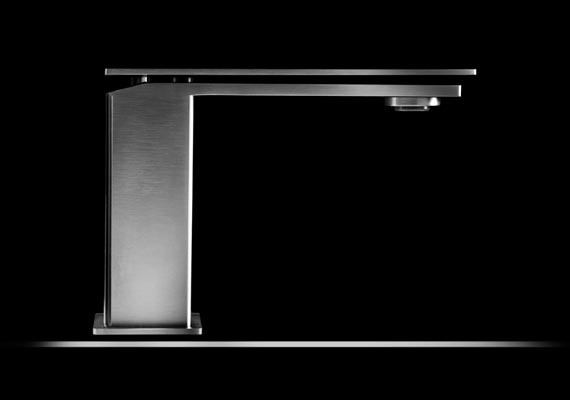 A choice that leaves the water spout completely exposed: an extremely captivating design for its purity and clean lines. CleoSteel is the interpretation of a cylindrical minimalist design, whose pure and simple forms, with a 40 mm diameter stainless steel body, are easy to incorporate in bathrooms with different identities. CleoSteel Mini was created as an even more minimalist variation of CleoSteel. The essential geometry, with a 35 mm diameter body, is reinforced by the stainless steel, a material that allows for countless combinations with other furnishing elements. 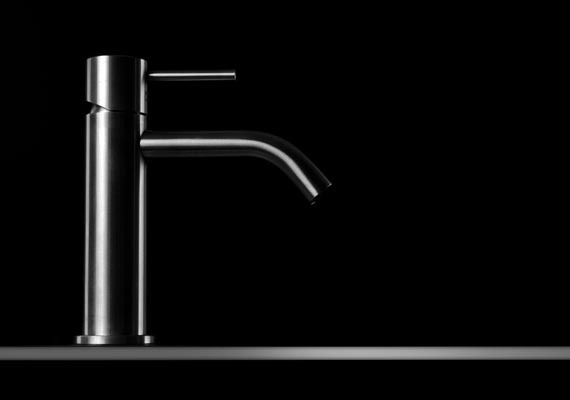 Fir Italia stainless steel taps and mixers are also suitable for the kitchen, where the characteristics of AISI 316/L stainless steel are just as important as they are in the bathroom: maximum hygiene and easy to clean; high resistance and durability; eco-friendly and 100% recyclable. FirUnico® is the new universal 5-way built-in system, compatible with all of the built-in wash-basin and shower solutions in the Fir Italia tap collections. 1. FirUnico® is equipped with 5 outlets; 4 side outlets for the shower area and 1 for the wash basin area. 2. Lead-free DZR brass body. Food grade gaskets. Equipped with a certified food grade (KTW, W270, ACS, NSF61, WRAS) flow control adapter made of technopolymer, which is completely non-toxic and fully recyclable. 3. Possibility of choosing among the 4 shower outlets, according to the design of the shower system you want to realize. 4. A single built-in system for any kind of built-in shower and wash basin mixers, whether traditional or thermostatic.